Restaurateur Adam Fleischman and chef Kiyoshiro Yamamoto (The Hump) have launched Ramen Roll in Culver City in the former Picnic LA space. Expect ramen and sushi hand rolls. Ramen Roll, 9900 Culver Blvd., Culver City, CA 90232, 310-426-8926. Disneyland has unveiled an exclusive new dining experience within the park. 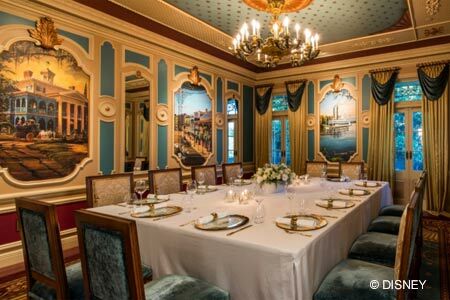 At 21 Royal, located in New Orleans Square (upstairs from the Pirates of the Caribbean attraction), guests will enjoy a customized tasting menu in an elegant private dining room, as well as a cocktail reception and other VIP treatment. The all-inclusive price rings in at $15,000 for a party of up to 12 people. 21 Royal, Disneyland, 1313 S. Disneyland Dr., Anaheim, CA 92802, 714-300-7749. Copenhagen-based brewer Mikkel Borg Bjergsø and business partner Chuck Stilphen have already delivered ambitious taprooms/restaurants to cities like Reykjavik, San Francisco and Seoul. The duo took over a 100-year-old, 7,600-square-foot building in downtown L.A. It will be called Mikkeller Bar. Expect coffee in the morning, a full-service restaurant for lunch and dinner, and 50 taps of craft beer, many from Mikkeller. The opening is scheduled for February 2017. Mikkeller Bar, 330 W Olympic Blvd., Los Angeles, CA 90015, no phone. Hollywood mourned the loss of its beloved The Cat & Fiddle, but the restaurant will re-emerge in spring 2017 on Highland Avenue in Susan Feniger’s former Mud Hen Tavern space. The Cat & Fiddle, 742 N. Highland Ave., Los Angeles, CA 90038, no phone. Making the jump from NYC, chef/restaurateur April Bloomfield (The Spotted Pig, The Breslin Bar & Dining Room) and business partner Ken Friedman will reportedly open a yet-unnamed restaurant in spring 2017 in the former The Cat & Fiddle location on Sunset Boulevard. Look for a revamped space (and patio) and a possibly Middle Eastern-leaning menu. French chef Jean-Georges Vongerichten will open his first California restaurant, Jean-Georges, at the new Waldorf Astoria Beverly Hills in June 2017. Vongerichten will oversee two eateries at the luxury hotel --- a fine-dining restaurant on the ground floor and a casual restaurant/bar situated on the 13th-story rooftop pool. 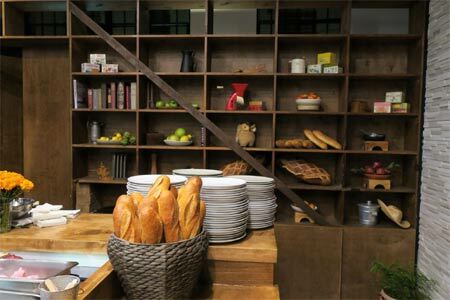 He has noted that the cuisine will be French-inspired farm-to-table, with California, pan-Asian and Latin influences. 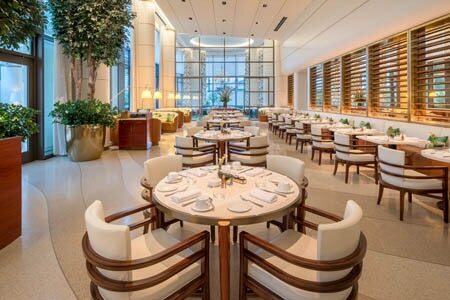 Jean-Georges, Waldorf Astoria Beverly Hills, 9850 Wilshire Blvd., Beverly Hills, CA 90210, 310-860-6666. Vito’s Pizza has opened a Westside location on Santa Monica Boulevard. Expect owner Vito DiDonato’s same fine, traditional East Coast pizza, alongside offerings like sausage and meatball subs, Caesar salad and cannoli. There’s craft beer in cans, some wine, and a cocktail list that includes a Manhattan, Moscow Mule and daiquiri. Vito's Pizza Santa Monica, 2455 Santa Monica Blvd., Santa Monica, CA 90404, 310-884-5900. Bardonna has opened a third location, Bardonna Silver Lake, on a hipster stretch of eastside Sunset Boulevard. For all-day breakfast find an English muffin with beer braised kale, fried egg and thick cut bacon; a huevos rancheros bowl with feta cheese and fermented chili; shakshuka; truffled avocado toast; and braised short rib beef hash. Lunch offerings include soups, salads and sandwiches. Expect a super long list of finer coffees, teas and house-made nut milks and kombucha. Bardonna Silver Lake, 3206 W. Sunset Blvd., Los Angeles, CA 90026, 323-522-6741. Mexican chef Maycoll Calderon (Huset) will open his first U.S. restaurant, Tintorera, in Silver Lake in the former Cowboys & Turbans space. Expect a summer 2017 opening with cutting-edge, contemporary Mexican fare and cocktails to match on a revamped, leafy garden patio. Tintorera, 2815 Sunset Blvd., Los Angeles, CA 90026, no phone. Restaurateur George Abou-Daoud’s (Delancey, The Bowery) latest venture is the modernist Middle Eastern restaurant Farida on Sunset Boulevard. Look for contemporary and traditional interpretations of regional Middle Eastern cuisine, with dishes like Mountain Prep Lamb Awarma, which follows a traditional mountainside preparation process and is served alongside hummus bi tahini, a nut and fig medley, lamb cracklings and a soft egg. Farida, 6266 Sunset Blvd., Los Angeles, CA 90028, ​323-498-5100. Shake Shack has set up shop in the Westfield Century City mall. The New York-based chain is known for its burgers, hot dogs, crinkle cut fries and "concretes" (frozen custard). 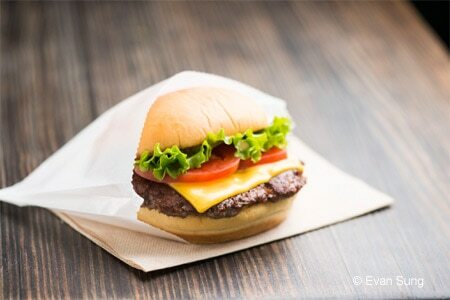 Shake Shack, Westfield Century City, 10250 Santa Monica Blvd., Los Angeles, CA 90067, 424-218-0076. Brooklyn chefs Sara Kramer and Sarah Hymanson teamed up with chefs Jon Shook and Vinny Dotolo (Animal, Son of a Gun) to open Kismet, a modern Mediterranean concept in Los Feliz. Kismet, 4648 Hollywood Blvd., Los Angeles, CA 90027, 323-409-0404. 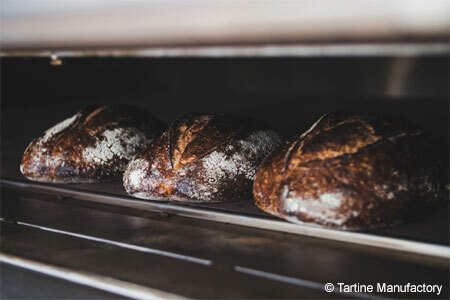 Chad Robertson and Elisabeth Prueitt of Tartine Manufactory in San Francisco are teaming up with Pizzeria Bianco chef/owner Chris Bianco and restaurateur Bill Chait on a Los Angeles location of Tartine Manufactory. Tartine Manufactory, 746 Terminal St., Los Angeles, CA 90021, no phone. Belle Belle’s Cue is now open for lunch on Cesar Chavez Avenue in Chinatown. Owner Justin Mi makes all sauces, rubs, sides and pickles in-house. The Texas-style BBQ menu has four types of wood-fired meat served by the half-pound family style, including brisket and turkey. Look for pulled pork sandwiches topped with homemade coleslaw. Expect potato salad, mac & cheese and creamed corn, too. For dessert, there’s homemade pecan pie. Belle Belle's Cue, 701 W. Cesar E. Chavez Ave., Los Angeles, CA 90012, 323-897-9227. 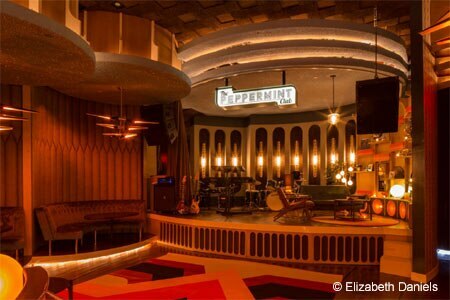 The h.wood Group’s John Terzian and Brian Toll partnering with Interscope Records have debuted a live music space called The Peppermint Club in West Hollywood. The h.wood Group’s Food & Beverage specialist Adam Koral oversees a signature mixology program with cocktails like The Billboard (Virginia Black whiskey, muddled strawberry, honey, lemon juice and soda). Expect a light ‘Snacks’ menu offering panini and finger foods. There will also be lounge-style bottle service and entertainment by resident artists and special guest performances. The Peppermint Club, 8713 Beverly Blvd., West Hollywood, CA 90048, 310-859-1011. For serious sushi connoisseurs, Sushi Ginza Onodera has landed in West Hollywood. This world-renowned chain’s flagship is in Ginza (with siblings in New York, Paris, Hawaii and Shanghai). Reservations are a must at the 16-seat blond-wood jewel box on Melrose and La Cienega; omakase, the sole option, starts at $300 per person. 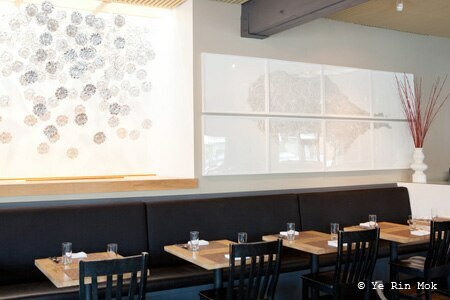 Chef Yohei Matsuki is transplanted from the acclaimed New York location. Look for wild-caught seasonal fish that changes daily and, of course, high-end saké to accompany. Dinner Tues.-Sun. Sushi Ginza Onodera, 609 N. La Cienega Blvd., West Hollywood, CA 90069, 323-433-4817. The 1920’s-themed Edmon has opened in the Hollywood Historic Hotel, injecting a bit of Art Deco glamour into the dustier side of Melrose Avenue with both a dining room and luxe bar. Beneath chandeliers and dark wood chef Gabriel Cappelli (Saint Martha) offers elegant American dishes like braised short ribs, double bone pork chops, scallops with lobster rillettes, and brûléed oysters and clams. Shaun Cole (Harvard and Stone, the Parish) oversees the fine, updated classic cocktail list. There’s live music too. Dinner Tues.-Sun. The Edmon, Historic Hollywood Hotel, 5168 Melrose Ave., Hollywood, CA 90038, 323-645-5225. Di Alba has opened in DTLA’s Arts District, offering specialty Roman-style focaccia sandwiches from chef Nina Clemente. Look for a breakfast focaccia with smoked salmon and caper lemon gremolata, a Parma focaccia with prosciutto and rosemary roasted grapes, and salads like beet and avocado with sherry vinaigrette and black quinoa with pomegranate and citrus. Lunch & Dinner Tues.-Sun. Di Alba, 827 E. 3rd St., Los Angeles, CA 90013, no phone. Executive chef D. Brandon Walker, chef Jill Davie (Josie) and Jorge Rivas have opened neighborhood restaurant The Mar Vista. The menu of “progressive Los Angeles cuisine” includes dishes like lamb churrasco with curried couscous, crispy kale and mint chimichurri. Bluegrass or jazz bands liven things up on Friday and Saturday nights. The Mar Vista, 12249 Venice Blvd., Los Angeles, CA 90066, 310-751-6773.
dineLA Restaurant Week returns January 13-27, 2017. This event offers diners the opportunity to indulge in specially priced menus from a variety of Los Angeles area restaurants, including AR Cucina, Birch, Erven and Spago Beverly Hills. 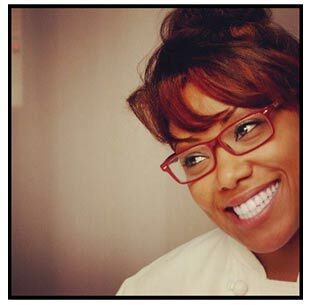 Former "Top Chef" contestant Nyesha Arrington announced via Facebook that she is cutting ties with her Venice restaurant, Leona. 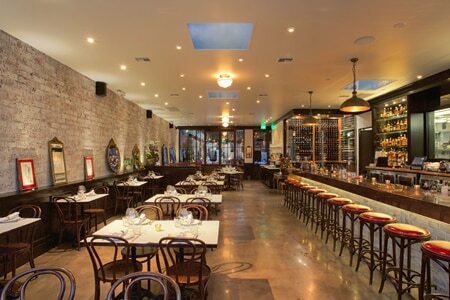 Leona, 123 W. Washington Blvd., Venice, CA 90291, 310-822-5379. Italian restaurant Bianconi is temporarily closed due to a fire. Bianconi, 8338 W. Third St., West Hollywood, CA 90048, 323-879-9777. 3 Square Café + Bakery in Venice closed after service on January 29, 2017. 3 Square Café + Bakery, 1121 Abbot Kinney Blvd., Venice, CA 90291, no phone. BLD, the beloved brunch spot from Neal and Amy Knoll Fraser, shuttered at the end of January 2017. The decade-old restaurant thanked its patrons and staff in a statement on its facebook page. BLD, 7450 Beverly Blvd., Los Angeles, CA 90036, no phone. The nearly century-old Formosa Cafe has closed. No word on if the closure is permanent or if it will reopen after a revamp or sale. Formosa Cafe, 7156 Santa Monica Blvd., West Hollywood, CA 90046, no phone. Century City seafood mainstay Gulfstream has closed. No word on what will replace this large Westfield Century City mall space. Gulfstream, Westfield Century City, 10250 Santa Monica Blvd., Los Angeles, CA 90067, no phone. Adieu, Terrine! The French brasserie from restaurateur Stéphane Bombet and chef Kris Morningstar closed its doors after New Year's Eve 2017 after two years of service. Terrine, 8265 Beverly Blvd., Los Angeles, CA 90048, 323-746-5130.